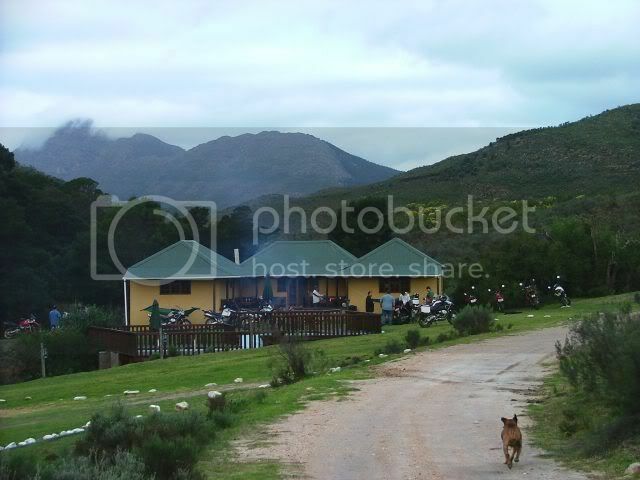 Attakwaskloof is my favorite destination. 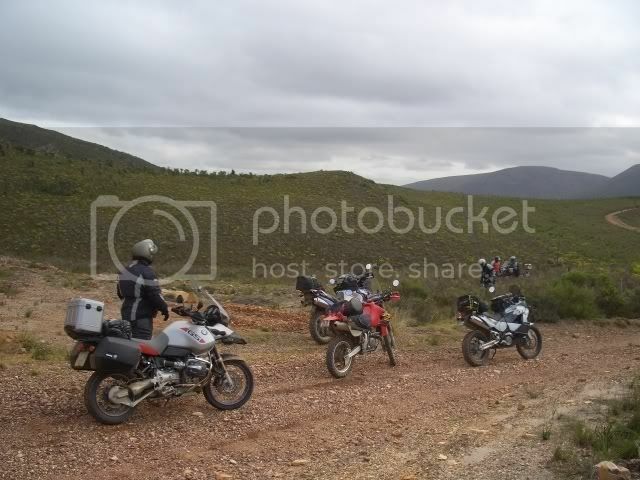 I speak about it often on the Wild Dog forum and as a result we decided to have another ride there to show some of the other Wild Dog forum members what the fuss is all about. On Saturday Morning, 21 July, Tobbox and I arrived at Honda George where Geoff, Kevin and Gavin were already waiting. Topbox has a great bike and I can seriously see one of these in my future! More and more bikes arrived. Introductions were done and bikes admired. Before long we were on our way. A couple of km’s from Fancourt we hit the first dirt. The roads were wet and muddy and the going was slow. At the first stop road conditions were the topic of discussion. A light bike with knobblies has big advantages in these conditions. Tyre pressures were adjusted and we were on our way again. As the road conditions improved people started enjoying the South Cape scenery. The second stop was at a river where we enjoyed snacks and drinks. Next stop was at Diesel & Dust to fill up on petrol. Then Uiltjie – being the perfect Gentleman – decided that he would break the ice. 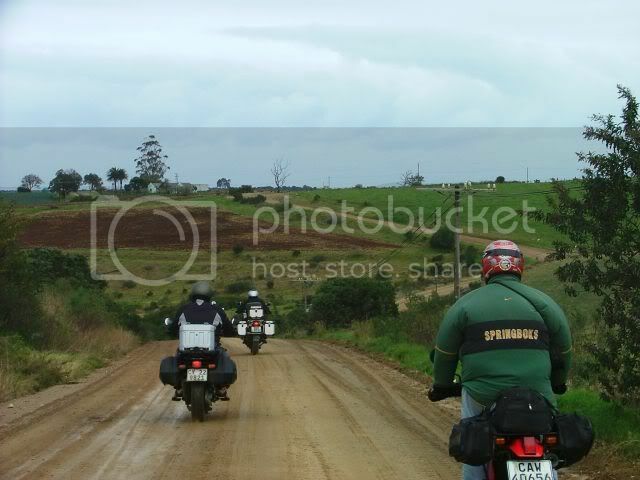 From freshly renamed Uitjie & Dust we followed the Haelkraal road and later turned North to Bonniedale Adventure Farm. This is a lovely road with ever changing scenery. It’s a nice spot – one of many on this route. From here it’s a short stint to the farm. I stopped at a gate to close it after everyone was through, but no one came. After a while we realized that something was wrong. 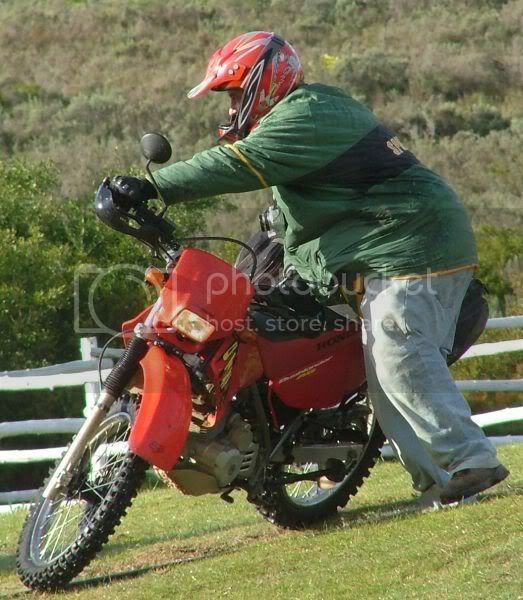 Clinton rode back and found that Kevin from PE overshot a corner and had quite a bad fall. 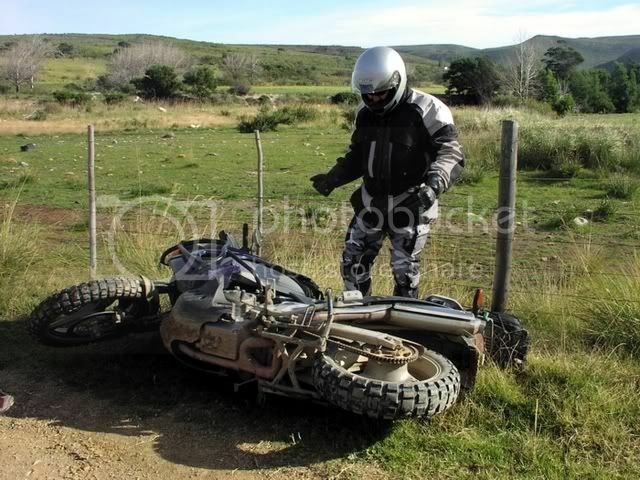 The bike had some damage but the rider was relatively OK, so we carried on to the farm. We unpacked and relaxed. The liquid refreshments were close at hand. When the sun started to set we were well underway to a great evening. When we woke this morning quite a few people weren’t as rowdy as the night before. Breakfast ranged from Weetbix to cold pies and braaivleis. Eisbein's bike Sauerkraut showing how cold it is. This is my favorite Kloof route - even better than Gamkaskloof or Baviaans. The pictures cannot do the scenery justice. It’s absolutely amazing. The Kloof road T’s into the Herbertsdale / Van Wyks dorp road. 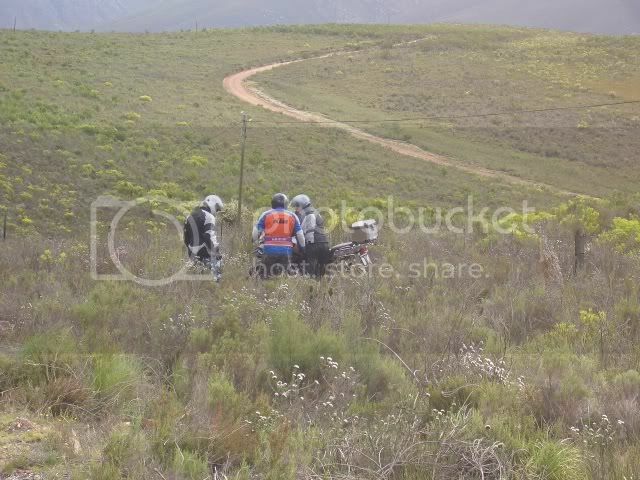 ...while we headed over Cloetes Pass towards Herbertsdale. At this turnoff the group split again and we said our goodbyes to the PE guys and Eisbein who continued to Hertsdale and the N2. LGF, “Sweeper” Mike, Clinton, Sir G and I took the scenic route back to George. And so another great ride came to an end. Thanks to all who attended – you guys made this ride a success. Special thanks to Sir G who led the group which in turn freed me up to take lots of pics, to “Sweeper” Mike who closed the gates behind all of us. I hope to see all you guys again in the not to distant future.